Life in the city can be stressful – for birds just as much as people. For humans, cities are expressly designed to put roofs over heads and food within easy reach, but the opposite can be true for many urban birds. They can find food and shelter harder to come by in the concrete jungle – with some notable exceptions. For any species in any habitat, survival is about problem-solving and adapting to the environment. So what street smarts do city birds need? And why do some species, such as lorikeets, crows and ravens, seem to dominate our urban landscapes? In general, urban birds must be bolder than those that remain in natural habitats, as can be seen by the boldness (or “habituation”) with which some species will forage for food with people nearby. But they also need to be able to avoid or retreat from unfamiliar objects or situations if they seem dangerous. City birds also need to withstand exposure to a wide range of pathogens. A study of birds in Barbados found that urban birds have enhanced immune systems relative to their country counterparts. While we have changed the environment in which some birds live, reducing resources in terms of food and shelter and increasing the number of pathogens that may impact their health, some birds have largely benefited from the new way of life. Within the urban ecosystem, there are winners and losers in the bird world. The suburban landscape, for example, now provides more nectar from flowers than native vegetation due to the gardens that people have established. This is a big help to nectar-feeding parrots such as Rainbow Lorikeets. A recent study in Sydney found that the lorikeets benefit from the increased abundance of flowers in urban areas, and their numbers were higher in the leafy suburbs than in bushland. Bold colours: Rainbow Lorikeets are among the most successful city birds. But if urban areas are such a rich source of nectar, why are some nectar-feeding species declining? The Regent Honeyeater feeds mainly on nectar and other plant sugars. It has been seen in orchards and urban gardens, but is listed as critically endangered by the federal government. This is partly because widespread clearance of woodland habitat has led to the increase of the aggressive Noisy Miner and Red Wattlebird. These species find it easy to “bully” other birds in open habitats. Noisy Miners have been observed pulling apart Regent Honeyeaters’ nests as they were being built. Regent Honeyeaters, in contrast, are less adaptable to changed landscapes, because they are migratory and rely on detailed knowledge of existing food sources. If these resources are changed or removed, they may not have enough interconnected patches of habitat to move safely towards new resources – potentially leaving them vulnerable to cats, foxes and aggression from other birds. Habitat loss can threaten some bird species or even leave them at risk of dying out if they do not locate alternative resources. The ability to find new food sources therefore becomes a valuable survival skill. What’s more useful: flexibility or intelligence? For some bird species, flexibility in finding food is crucial in making a successful switch to urban environments. One example is the Grey-crowned Babbler, which is endangered in Victoria, but my colleagues and I have documented it living in a suburban area in Dubbo, New South Wales. This species usually nests in coniferous woodland and forages in the leaf litter beneath the trees. 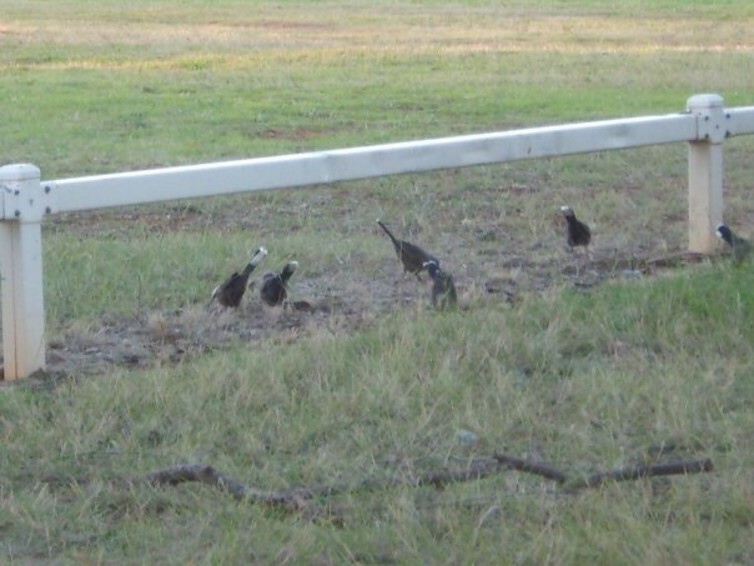 But in Dubbo, we saw these birds feeding on lawns, in playgrounds and even in leaf litter along a train track at the back of urban housing, sometimes visiting backyards along the way. This suggests that these birds can survive the loss of their woodland habitat by being sufficiently adaptable to life in the suburbs – as long as they can continue to find enough food, disperse between nearby groups and have access to native nesting trees. Grey-crowned Babblers can adapt to new landscapes. For other species, such as crows and ravens, intelligence seems to be the key. These species can survive anywhere in the urban sprawl, including places where trees are scarce but rubbish bins are everywhere. Crows and ravens can literally pull food out of a bin and eat it – clearly a learned behaviour that has resulted from problem-solving. These birds are highly opportunistic and social, allowing them to learn new ways of adapting to the almost complete removal of their natural environment. What we can deduce from these examples is that some birds, like Rainbow Lorikeets and Grey-crowned Babblers, can adapt successfully to the urban sprawl as long as some characteristics of their habitat still remain. Other species, such as crows, have gone a step further and worked out how to survive purely on urban resources – effectively making a living in an environment that is completely unnatural to them. This suggests that the more we urbanise an area without natural aspects, the less bird diversity we will have – and the more our urban areas will come to be dominated by those few species that are hardy, clever or adaptable enough to thrive. Luckily, some councils in Australia and cities throughout the world are bringing the natural aspects of the forest back into the concrete jungle, so that a wider range of birds might survive here. More research is needed to work out exactly what each species will need, but planting more native plants is always a good start.